Precor continues to deliver with the Precor RBK 835 recumbent exercise bike. Listed at $4,299, it’s certainly pricey, but you’re getting a commercial quality bike for in-home use. The RBK 835 features an oversized, LED console that displays resistance, RPM, speed, calories burned (per minute and per hour), heart rate, elapsed time, time remaining in workout, target and current heart rate and a complete summary of your workout. The console is battery operated, so no plug is needed. 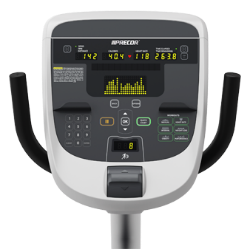 Check out the RBK 835 On Sale at the Official Precor Website! The RBK 835 is designed for in-home use, but it’s got the heart of a commercial machine – it will keep running smoothly long after you’ve given up on your most gruelling workout. It is very similar to its upright sister model, the UBK 835. The reviews are overwhelmingly favorable on this recumbent bike, primarily because users discover how comfortable it is. They praise the Airflex ventilated seat and back because it’s easy to adjust to eleven different positions, practically guaranteeing you can find the perfect angle. Users also take note of the step-through design. When you step through, you only have to raise your foot about 4 inches from the floor, making it ideal for anyone with limited range of motion. 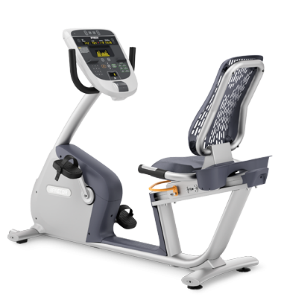 Reviewers appreciate the incredibly quiet ride and smooth glide of the Precor RBK 835 recumbent exercise bike, which lasts for years even when used daily. Precor is one of our favorite fitness equipment companies because they always deliver an outstanding product, and the RBK 835 recumbent exercise bike maintains their reputation beautifully. Lots of research and development are obvious in the biomechanics of this recumbent bike. Their Knee Over Pedal Spindle (KOPS) positioning alleviates any strain on the knees so that users can get the workout they need without damaging their joints. With 25 levels of resistance and 12 programs, you’ll never get tired of using this top quality machine. It even looks expensive, but you’re getting every penny’s worth, particularly since the warranty is outstanding. How many companies offer a warranty on the parts and electronics for 10 years? Not many! Although it’s expensive at $4,299, the Precor RBK 835 recumbent exercise bike delivers one of the smoothest, quietest rides you can find anywhere. Whether it’s for rehab, cardio health or cross-training, the RBK 835 is a joy to own and use.